Learning to tell the time is one of the most practical math skills kids will learn. Maybe these skills won’t be used as often when children are young as when they are older, but they definitely will be used. Just think for a minute how many times you check the time each day or even just wonder what time it is. Probably more than you think! At this time, you’ll find below some awesome telling time worksheets specifically created for first grade. Go to this page to choose from all the math worksheet categories on this site. Get ready to tell time! These four big clocks show the times of 1:00, 5:00, 7:00, and 11:00. What would be different if they were am or pm times? How do you do? Oh, I am fine! What do you know, it’s just now 9! 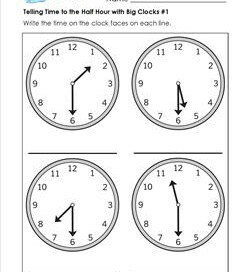 On these four big clocks you will find 9:00, along with 3:00, 6:00, and 12:00. The hands are in place. 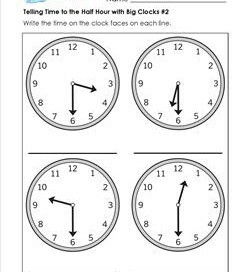 Can you tell the time on each of these four big clocks? Look at the hour hand, then the minute hand. Write the times on the lines. Look at this worksheet carefully. 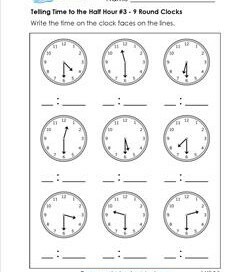 Telling time to the half hour can be trickier than the hour. They tell the times of 1:30, 5:30, 7:30 & 11:30. Kids can tell the time to the half hour on these four large clocks. Simply look at the clocks and write the times on the lines under each one. 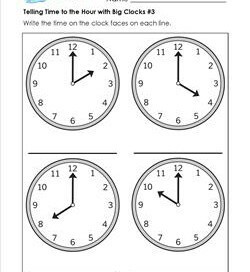 Have your kids show their time telling smarts by writing the times on these four large clocks. The times are 2:30, 4:30, 8:30 and 10:30. 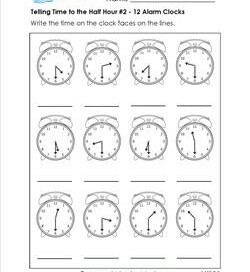 In this clock worksheet kids use their special drawing skills to draw the hour and minute hands for 1:00, 5:00, 7:00, and 11:00. Dexterity a problem? Just learning to draw the time on the clock? This worksheet is perfect for you! Draw the times 3:00, 6:00, 9:00, and 12:00. 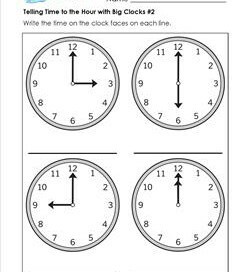 These four large clocks make it easy for kids to draw the time to the hour. 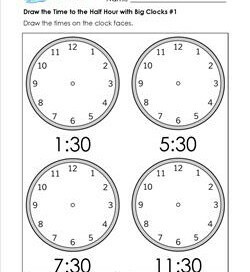 You will find these four hours on this worksheet: 2:00, 4:00. 8:00 and 10:00. 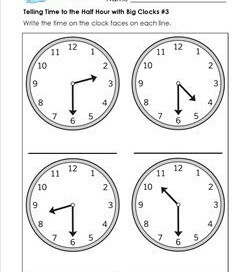 Draw the time to the half hour with these four big clocks. They have the times 1:30, 5:30, 7:30 and 11:30. Answer sheet included. 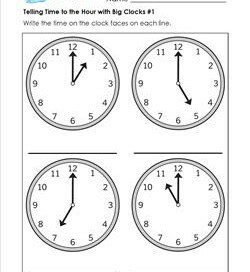 Kids will need to draw longer lines to make the hour and half hour hands, but have plenty of room on these four big clocks. Drawing the time to the half hour can be a little tricky. Remember to draw the minute hand on the 6 and the hour hand just after the hour.